Hong Kong’s Noonday Gun is fired each day at noon as a matter of tradition and timekeeping. 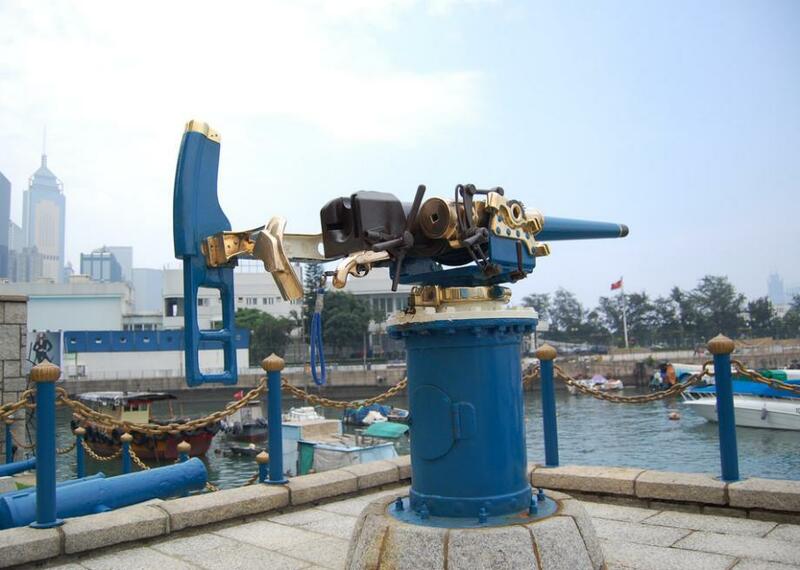 Situated on a small enclosed site in the waterfront district of Causeway Bay, the Noonday Gun is a Hotchkiss three-pound artillery piece that is ceremonially fired every day at (appropriately enough) noon on the dot. While this practice is somewhat charming in its own right, the details behind the practice—such as the owner of the gun and the purported genesis of the tradition—provide striking insight into Hong Kong’s British colonial history. The gun is owned by Jardine Matheson, a massive British conglomerate that was one of the first trading houses, or “hongs,” in Hong Kong. The land that is now Causeway Bay was bought by Jardine Matheson in 1841 and was in fact the first piece of Hong Kong sold at public auction by the eager new colonial government. With its roots in imperial China, Jardine Matheson was involved in shipping tea and cotton but also made a great deal of money from the illegal opium trade. They built the company’s main offices and warehouses—known locally as godowns—on the newly acquired plot. The Noonday Gun has its roots in a 21-pound gun that Jardine Matheson set up on the waterfront of its commercial fiefdom. According to the commonly related story, the company’s private militia would fire the gun in salute whenever the head of the company (or, in some versions, whenever one of the company’s ships) sailed into or out of the harbor. In 1860, a senior officer of the Royal Navy, new to town and unfamiliar with the practice, found this offensive, as typically only government dignitaries or military officers receive such treatment. As a reprimand, Jardine Matheson was ordered to henceforth fire the gun every day at noon, providing a service in the form of a public time signal. The probable kernel of truth in this story is the gun’s role as a public time signal. This was a common practice in many harbors in the 19th century, allowing all ships within auditory range to correctly calibrate their on-board clocks, which they used on voyages to calculate longitude. Thus, the Noonday Gun is most likely a practical measure that became so common to daily harbor life that it morphed over time into a local tradition. The original gun was dismantled by the occupying Japanese Imperial Army in 1941. A new gun was donated by the Royal Navy after Hong Kong was liberated in 1945; this gun (humorously enough) received noise complaints and was replaced by the current, smaller gun in 1947. This gun has a history of its own, having seen action in the Battle of Jutland during the First World War.